Synthetic peptide corresponding to Met Enkephalin conjugated to Keyhole Limpet Haemocyanin (KLH) (Glutaraldehyde). The conjugate was dialysed to remove excess conjugating agent prior to immunisation. Our Abpromise guarantee covers the use of ab22620 in the following tested applications. IHC-R 1/500 - 1/4000. (Using overnight incubation and ABC/PAP procedure). Dilutions up to 1/10,000 have been achieved under optimised conditions. 1/200-1/4000, using overnight incubation and indirect immunofluorescence procedure. All standard crosslinking agents may be used, but formaldehyde based solutions are recommended. Frozen sections and Vibratome slices are recommended for tracttracing. Met- and Leu-enkephalins compete with and mimic the effects of opiate drugs. They play a role in a number of physiologic functions, including pain perception and responses to stress. PENK(114-133) and PENK(237-258) increase glutamate release in the striatum. PENK(114-133) decreases GABA concentration in the striatum. 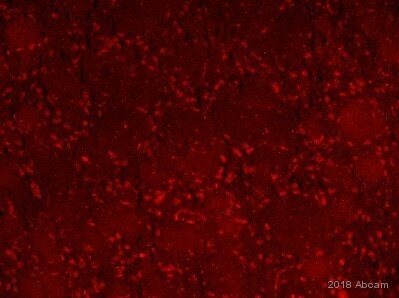 ICC/IF image of ab22620 stained SHSY5Y cells. The cells were 100% methanol fixed (5 min) and then incubated in 1%BSA / 10% normal goat serum / 0.3M glycine in 0.1% PBS-Tween for 1h to permeabilise the cells and block non-specific protein-protein interactions. The cells were then incubated with the antibody (ab22620, 1/1000 dilution) overnight at +4°C. The secondary antibody (green) was Alexa Fluor® 488 goat anti-rabbit IgG (H+L) used at a 1/1000 dilution for 1h. Alexa Fluor® 594 WGA was used to label plasma membranes (red) at a 1/200 dilution for 1h. DAPI was used to stain the cell nuclei (blue) at a concentration of 1.43µM. ab22620 (4µg/ml) staining met enkephalin in human testis using an automated system (DAKO Autostainer Plus). Using this protocol there is cytoplasmic staining of seminal vesicles. Publishing research using ab22620? Please let us know so that we can cite the reference in this datasheet. A customer would like to know which species this antibody is guaranteed to be used in as it is not on the datasheet? I can confirm that ab22620 was tested and is guaranteed for human samples. If your customer would like to use this antibody with another species, I will be happy to issue a testing discount. I hope this information is helpful. Please do not hesitate to contact me again with any further questions or if your customer would like to test this antibody in another species. Needs an antibody that will react with Leu and Met Enkephalin in monkey brain stem sections that were perfusion-fixed (IHC-FoFr). Thanks for your call today. I ran a BLAST with the immunogen of ab98128 against the Met and Leu sequences on SwissProt, and though the immunogen contains the entire Met sequence (YGGFM), it does not contain the full Leu sequence (only YGGF). So, this antibody might not react as strongly with the Leu enkephalin. Since none of our enkephalin antibodies have been tested in perfusion-fixed monkey tissue, I can offer a discount off a future purchase if you buy one of these antibodies now, test it in IHC-FoFr with monkey tissue, and submit feedback to us in the form of an Abreview. The discount is worth 1 free primary antibody. If you are interested in this offer, please follow these steps: 1. Reply to this e-mail to let me know that you would like to proceed and test one of these antibodies. I will then send a discount code. This code must be issued before purchasing the antibody so please wait for my reply before ordering. 2. Purchase the antibody either by phone, fax, or online (www.abcam.com). 3. Test it in IHC-FoFr on monkey tissue. 4. Let us know the results, positive or negative, using our Abreview system (this will take about 10 minutes and images are great if you have them!). To find out how to submit an Abreview, please visit: https://www.abcam.com/abreviews. 5. After the review is submitted to us, the discount code becomes active. Simply place your new order by phone, fax, or on the web and mention the discount code. The discount can be redeemed for any primary antibody ordered and the discount code is valid for 4 months after issue. We are always pleased to obtain feedback about our products and any information is greatly appreciated! Even if the antibody turns out to be unsuitable, you will still receive the discount on your next purchase after your Abreview has been submitted. Please let me know if you have any questions about this offer and I would be happy to help you further. The Terms and Conditions of this offer can be found at: www.abcam.com/collaborationdiscount.